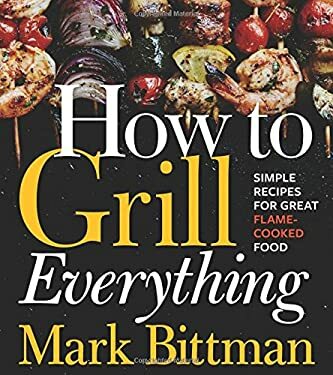 The ultimate grilling guide and the latest in Mark Bittman's acclaimed How to Cook Everything series Here's how to grill absolutely everything--from the perfect steak to cedar-plank salmon to pizza--explained in Mark Bittman's trademark simple, straightforward style. Featuring 1,000 recipes and variations, plus Bittman's practical advice on all the grilling basics, this book is an exploration of the grill's nearly endless possibilities. Recipes cover every part of the meal, including appetizers, seafood, meat and poultry, vegetables (including vegetarian mains), and even desserts. Plenty of quick, high-heat recipes will get dinner on the table in short order (Spanish-Style Garlic Shrimp, Green Chile Cheeseburgers); low and slow "project" recipes (Texas-Style Smoked Brisket, Pulled Pork with Lexington BBQ Sauce) are ideal for leisurely weekend cookouts. You'll also find unexpected grilled treats like avocado, watermelon, or pound cake, and innovative surprises--like cooking meat loaf or from-scratch Rosemary Olive Oil Bread on the grill--to get the most out of every fire.